= Tsukue no shita ni kakurete ne. = Hide under the table! As we all know we had a big earthquake in Japan and it took a lot of people’s lives. My deepest sympathies and prayers goes out to everyone affected by this disaster. Also thank you so much for all your concern and encouragements. We have received so many warm messages from all over the world. As a Japanese person, I was personally moved to tears to receive your love and support. For those who live in Japan, there are many helpful sites. We all worry about the ongoing aftershocks and 放射能 (= houshanou )= radiation leakage problem from the 原子力発電所 (= genshiryoku hatsudensho )= atomic power plants. But 冷静になりましょう！(= “Reisei ni narimashou”) = let’s keep our heads, and not overreact. There too much information out there, and some people are panicking prematurely. I will make this lesson for everybody who is in Japan or is coming to Japan in the future. Hopefully this will help you stay safe. Although it is painful for me to make this type of lesson, I think it might be useful in case of emergency. But the motive of this lesson is not to make you worry. 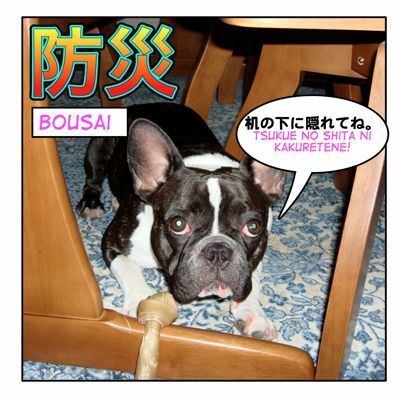 It is to help you deal with any situations calmly in Japanese. Knowing other languages helps you to enjoy your trips and your life when you travel or stay in another country. At the same time knowing language helps you survive whenever something happens to you. In other words, if you don’t know the language, there are more chances that you will feel very frightened because you will not know what is happening around you. There are a lot of sources information in Japanese but you might feel as if there is absolutely no information because a lot of TV news is not bilingual. First, you need to understand some basic words to help you understand what is being said on TV, the internet and to communicate with the people around you. You need to be able to get the basic information and find out what is happening. And it will be more useful if you can understand Japanese news even if it’s just a few keywords or phrases. And when you don’t know what is happening, you need to be able to ask the people around you quickly in Japanese. I really hope you don’t need to ever use this lesson now or in future but it’s good to be prepared. We have a saying 備えあれば憂い無し。= Sonae areba urei nashi.= If you are prepared, you don’t have to worry. = Kinkyuu jishin sokuhou desu. = This is an emergency earthquake warning. = ＊ji＊pun/fun,(name of the place) de tsuyoi jishin ga arimashita. = There was a big earthquake in (name of the place) at (time). = Kakuchi no shindo wa wakari shidai oshirase itashimasu. = We will announce the seismic intensity scale of each affected area as soon as we know. We also describe the seismic intensity with マグニチュード= magunichuudo = magnitude later but it is pretty common to describe the intensity with 震度 = shindo in Japan. There are 10 different levels. Most people don’t feel any shakes. Most people in a quiet room can feel. Most people in the house feel it. Most people get surprised. Hanging objects such as lamps will swing and unstable ornaments in the house might fall. Most people feel frightened and try to hold onto something to walk. Most books and dishes fall from cupboards or bookshelves. An unstable brick wall might fall. It is difficult to walk without holding onto something. Unfixed furniture might fall. It is difficult to stand. Most unfixed furniture will move or fall. Some doors won’t be able to open (because the frames will be twisted). Tiles on the wall or roof or window glasses might fall. Less earthquake-resistant wooden houses might fall or tilt. You can’t move without crawling. Sometimes you are knocked down. Most unfixed furniture will move and may fall. More less-earthquake-resistant wooden houses or buildings will incline or collapse. Landslides and cracks in the ground may also occur. Even high-earthquake-resistant buildings might occasionally incline. Many low-earthquake-resistant concrete building will collapse. = (location) de jishin. Tsuyoi yure ni keikai. = There was an earthquake in ~ . Be careful of strong shakes. = Tsuyoi yure ni keikai shite kudasai. Note: Many people registered for “the earthquake alert” on their cell phone company. = A level 5 lower earthquake is coming within 10 seconds (more or less). Check where it is. Check the Japanese map and make sure which area is affected. and if you live on the seacoast, check for tsunami warnings. After an earthquake, there are often aftershocks so you have to keep alert. They say sometimes aftershocks are bigger than the initial quake. = Tsunami no shinpai wa arimasen. = Tsunami keihou ga happyou saremashita. = They issued a tsunami advisory. = ~ ga happyou saremashita. = Tsunami keihou ga happyou sarete iru no wa tsugi no engan desu. = The tsunami warning just announced affects the following seacoasts. In case of event of tsunami, go to a 高台 = takadai = upland, high place, up on hills as fast as you can. I know there are a lot of useful sites — like the ones I mentioned above — but basically 安全確保 = anzen kakuho = to stay safe is key and 火の元に注意= hino monto ni chuui = be sure to turn off the stove, heater or gas. 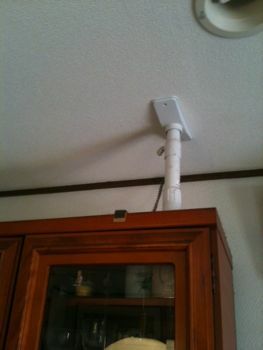 3) 揺れが静まったら(= Yure ga shizumattara) =When the shakes settle, → Turn off the stove, heater or gas as soon as possible. 4) Open the doors, windows. 5) Don’t use the elevator when you escape. 6) Avoid being close to the building, vending machines, concrete walls, power lines, signs. Try to get into an open area. = Hijouguchi wa doko desuka? = Where is the emergency exit? = Kaidan wa doko desuka? = Where are the stairs? = Deguchi wa doko desuka? = Where is the exit? Ex. 火事だ！= kajida! = Fire!! = Hai ichiichi kyuu (hyakujyuukyuuban )desu. Kaji desuka? Kyuukyuu desuka? = Hello, this is 119. Is it a matter of fire or you need an ambulance? =It means someone has “sudden illness”. This is emergency. Someone is really sick! or injured. = Please send us an ambulance. = Please send a firetruck. They will ask for your location and name. Then they’ll ask you to clearly describe what happened. = Kaji desu. Naka ni hito ga imasu. = There is fire! There is someone inside. = I am (or someone is ) injured. = Sumimasen ichiichi kyuu (or hyakujuu kyuuban )ni denwa wo shite kudasai. = Sumimasen hyakutouban (or keisatsu) ni denwa shite kudasai. = Please call 110. / Please call the police. *This is emergency, it doesn’t matter if you are a man or woman, just remember if someone says this you have to get out of there! = nani ga okita no desuka? = What should I do? = Doko ye ittara iidesuka? = Where should I go? = Nihongo ga yoku wakarimasen. Yukkuri hanashite kudasai. = I don’t understand Japanese well. Please speak slowly. = Dareka eigo ga wakaru hito wa imasenka? = Is there anybody who speaks English? = Komatte imasu. Tasukete kudasai. = I am in trouble. Please help me. = Koko wa kiken desuka? = Is it safe here? = Tadachi ni hinan shitte kudasai! = Please evacuate as soon as possible. Every district has its designated 避難所 = hinanjo = shelter Usually at a school gym or city hall where they can have a lot of people. = Doko ni hinan shitara iidesuka? = Where should I evacuate to? = Hinanjo wa dokoni arimasuka? = Where is the shelter? = Eki made douikeba iidesuka? = How can I get to the station? = Hinanjo made aruite donogurai desuka? = How long does it take to get to the shelter from here on foot? So basically in order to get information, you may have to ask a lot of questions. = Koushuudenwa wa doko desuka? = Denwa wo kashite kudasai. = May I use your phone? = 〜 wa doko de kaemasu ka? = Where can I buy 〜? = Denchi wa doko de kaemasuka? = Where can I buy batteries? = Mizu wa doko de moraemasu ka? = Where can I get water? = (verb) temo(demo) daijoubu desuka? = Can I / Is it OK/ Is it Safe to verb? = Suidousui wa nondemo daijoubu desuka? = Is it OK (safe) to drink tap water? = Mizu wo itadakemasu ka? = Could you give me some water please? = Give me 〜, please. = Give me a map, please. = Let me use 〜 please. = Toire wo tsukawasete kudasai. = Please let me use the bathroom. = Keitai wo juuden sasete kudasai. = Let me charge my cell phone. = Aiteiru mise wo sagashite imasu. = I am looking for an open store. = Tomodachi wo sagashite imasu. = I am looking for my friend. = Doko ni ittara kaemasuka? = Where can I buy it/them? = Doko de kiitara wakarimasu ka? = Where can I get the information? = Dare ni kiitara wakarimasu ka? = Who should I ask? During the disaster, a lot of trains, airplanes, subways or buses will stop or reduce the service. A lot of people couldn’t go home and they are called 帰宅困難者 = kitaku konan sha Now I will teach you some of the key words/sentences in order to understand what it is said in the announcement. •ダイヤが乱れる = daiya ga midareru. = daiya ga midarete imasu. = The timetable has been disrupted. = jishin no tame zensen de unten wo miawasete imasu. = Due to the earthquake, all lines have been temporarily suspended. = Heijou doori untenn shiteimasu. This is something new and we have never done it in Japan. = Kono chiku no teiden wa nanji kara nanji made ka shitteitara oshiete kudasai. = Please tell me if you know from what time until what time the blackout in this area is? 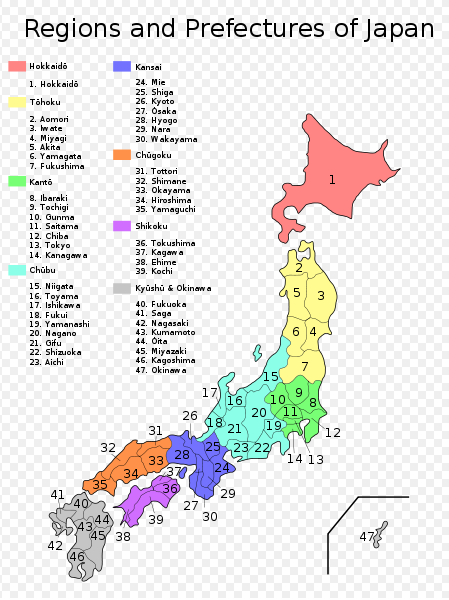 Japan is known as one of 地震大国 = jishin taikoku = the biggest earthquake countries. 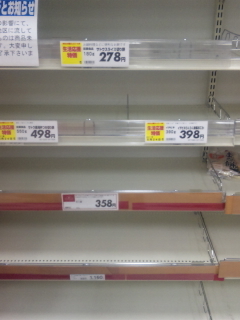 After having the big earthquake in Hanshin or Nigata area, people are more prepared for the earthquakes. Many people put a pair of shoes in the bedroom so that they can escape immediately. Recently panicked people hoard food,water, toilet papers, and etc. It is sad to hear that even people who even live far away try to buy up stuff supplies that they do not really need. This is mostly done out of fear. There is a kind of internet campaign or movement or operation=作戦=sakusen encouraging people not to hoard supplies. It is called 上島作戦= ueshima sakusen = Operation Ueshima. 上島=Ueshima is a name of a member of a comedy trio, ダチョウ倶楽部=Dacho Club and someone named this operation using their a gag line, 「どうぞどうぞ」 = Please go ahead! And if you see a hash tag #yashima that is from ヤシマ作戦= yashima sakusen = Operation Yashima which support saving energy and it originally came from Evangelion. Last but not least, a lot of people asked me how to encourage their Japanese friends. It is not a specific lesson but check my 労る= itawaru lesson. I will add a little bit here. = Jishin ga arimashitaga daijoubu deshitaka? = There was an earthquake. Are you OK? = Gokaoku wa minasan buji deshitaka? = Is everybody in your family all right? = I would like to express my deepest sympathies. = I am glad you are safe. = Gobuji de hontou ni yokattadesu. = I am glad you are OK.
I’m relieved to hear you are OK.
= Buji to kiki anshin shimashita. = Buji to kiki ni hotto shimashita. Please keep us sending positive thoughts. You are all wonderful and I love you all! =Anshin shite kuraseru utsukushii kuni nihon ga mata genki ni naru koto wo shinjite kudasai. = Please believe that beautiful Japan where we can live safely will be healthy again. Thank you so much for all these translations and pronunciations, it’s exactly what I was looking for! I hope everyone’s okay! You’re welcome and Thank you for the comment! Please come back! Hey Yukari *hugs* I am so so sorry for this happening to Japan. The day it happened i was so so sad and started tearing up. It still bothers me and i really wish i could do so much more than watch videos in amazement and disbelief. I really appreciate you taking the time to make this lesson and show us how much you love us even though so much is going on. Its really hard to type this right now. Thank you so much again and you are all in my thoughts each day. Thank you so much for your warm message. So many people in the world have worried about Japan. And we are very very happy to feel your love. I don’t have anything to return to you all so what I can do is keep making lessons for everybody. Uhm, I’m just wondering what happened to Tashirojima (Cat Island). It’s near Ishinomaki, right? I hope the island and its inhabitants are okay. Where did you hear about Tashirojima? Actually many people are worried about that island as well. Seems to be a nice little island with all the nice people. Hope they are all safe,too.